Barbados contracting company Infra Inc. is nearing completion of the replacement of aging water mains using trenchless construction methods never before used in the country. Horizontal directional drilling (HDD) was used in eastern portions of the project, including Bridgetown, because open trenching would be too disruptive to both vehicular and pedestrian traffic. Installing pipe in the ground without excavation reduces damage to landscaping, other surface improvements and streets. The HDD process uses a drilling machine to bore a horizontal pilot hole along a defined path. Upon completion, the drill unit pulls the pipe back through the hole. As the pilot hole progresses sections of drill pipe are added. When the pipe string is pulled back to the drilling unit to pull the product into the pilot hole drill pipe sections are removed. Electronic guidance equipment is used to monitor the location of the drill head and provide information to make steering adjustments. A small radio transmitter in the drilling head transmits information about the location and orientation of the bit and head to a crew member who walks directly above using a handheld receiving unit. Information is displayed on a screen at the top of the receiver and to a remote display at the drill machine’s operator station. The operator changes direction of the bore by changing the orientation of the drilling head. On the water project, Gill said Infra completed 12 bores ranging in length from 400 to 1,500 feet to install high-density polyethylene (HDPE) pipe in diameters from 6 to 16 inches. For larger sizes of pipe, the pilot hole is enlarged by pulling backreamers through the pilot hole making one or several passes, depending on the size of pipe and soil conditions. Infra uses Subsite® Electronics TKQ HDD guidance equipment to guide bores made by its Ditch Witch® JT100 All Terrain (AT) HDD drilling rig. 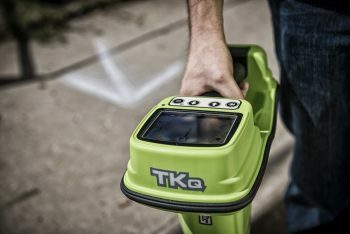 The TKQ system has a four-frequency transmitter in the drill head to provide the best possible signal in conditions where other utilities may cause interference. Its Drill-To™ mode enables the operator to make real-time corrections in steering based on information transmitted to the receiver and walkover information. The JT100 AT directional drill was used on the project because its dual-pipe mechanical drilling system would be effective in the rocky conditions expected to be encountered, Gill said. Pipe bursting–the other trenchless method employed on the water project by Infra–employs a powerful winch that pulls a bullet-shaped tool through existing pipe, breaking up the old pipe and pulling in new pipe behind it. Excavation is minimized because new pipe follows the path of the old pipe. The project called for 55 bursts averaging 400 feet per burst. A Hammerhead® HB100 static bursting system was used. The total project involves installation of approximately 38 km of HDPE and PVC (polyvinyl chloride) pipe. Some of the pipe that was replaced had been in service for more than 100 years. Project owner is the Barbados Water Authority. The JADA Group, Spring Hall in St. Lucy, was the primary organizer of the project. JADA Builders is primary contractor and Infra Inc. constructed the HDD and pipe bursting segments. Other JADA companies involved included Infra Rentals, Bess Mining, and Cemix. Services of the JADA group of companies include planning and development, civil engineering, construction, construction management, manufacturing, surveying, information technology, and equipment rentals.